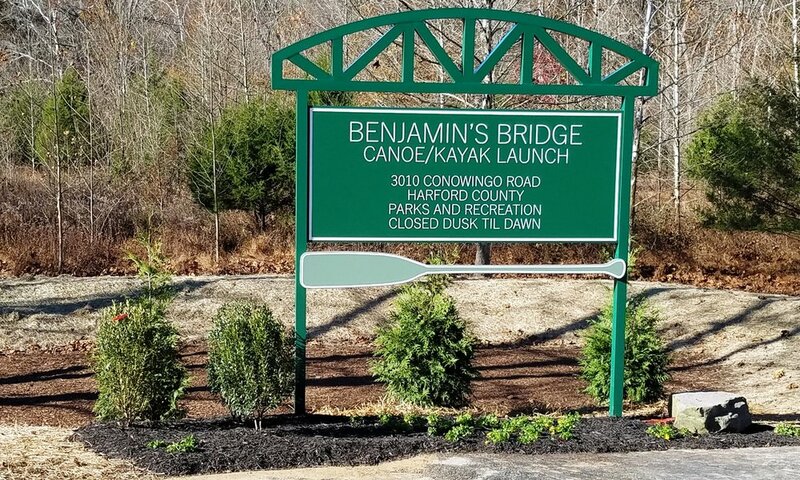 Benjamin's Bridge Canoe/Kayak Launch — BayLand Consultants & Designers, Inc. The Deer Creek Canoe/Kayak Launch was proposed at 3010 Conowingo Road in Street, Maryland. The property is owned and maintained by Harford County Department of Parks & Recreation as a public conservation area with limited access. There was no existing public access to the conservation area or formal waterway access to Deer Creek. BayLand was contracted for the design and construction of public site improvements for a paved access road with associated parking, Americans with Disabilities Act (ADA) compliant pedestrian trail, widening of Maryland State Highway Administration (SHA) Route 1 for an acceleration/deacceleration lane, and a natural kayak launch. Structural and non-structural stormwater management environmental site design methodologies such as alternative surfaces, swales, rain gardens and disconnection of non-rooftop runoff were utilized to treat runoff from impervious area generated by the project. Because the proposed improvements were located completely in the Federal Emergency Management Agency (FEMA) 100-year floodplain, critical approval by the Harford County Planning and Zoning Floodplain Management Program was achieved by using the innovative technique of compensatory storage to offset any fill that was needed. Construction began in August in 2017 and was completed in November of 2017 ahead of schedule and under budget.